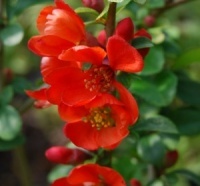 Wonderful vivid red flowers smother this easy to grow medium sized spreading shrub in early spring. Followed by the well known yellow orange coloured fruits in autumn. 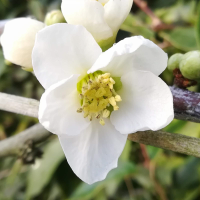 A relatively new variety Chaenomeles Geisha Girl is very different with its apricot coloured double flowers born profusely over this medium sized shrub. Flowers a little later than others. 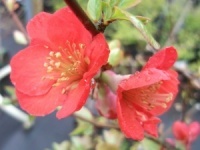 Also known as Chaenomeles Apple Blossom which describes this medium sized spring flowering ornamental quince perfectly. The branches are laden with dense clusters of soft pink and white flowers, quite superb. 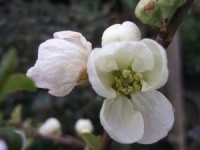 Another form of "Japonica", with large pure white flowers in early spring. Makes a smallish shrub of open habit which allows the peach pink double flowers to be displayed to perfection. 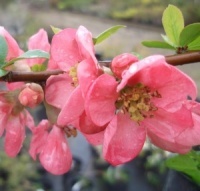 The Japanese quince, 'Pink Lady' is a lovely small shrub, 1m spread, 1m hight. With glossy green leaves and pink flowers in the spring with fruits turning yellow for an autumnal display.